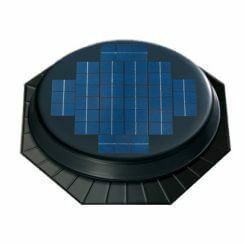 A roof repair job can range anywhere from fixing a leak to re-coating or replacing the entire roof. Nevertheless, in many cases the same techniques used in more severe cases of roof damage are used to deal with smaller issues. Not only can this be expensive and time consuming but thanks to Chemlink Roof Seal Roof Repair Tape, it is entirely unnecessary. 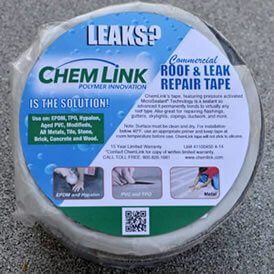 Chemlink Roof Seal Roof Repair Tape is versatile, works on all roof types, and is easy to use… Clean, Stick and Apply Pressure – you’re done! 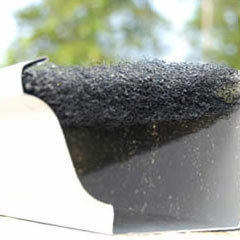 Chemlink Roof Repair Tapes quickly fix leaks on most types of roofs. Advanced MicroSealant Technology instantly & permanently bonds to EPDM, Gutters, Flashings, Single Ply & PVC. Chemlink Roof Repair Tapes featuring MicroSealant technology are formulated from non-butyl synthetic rubbers and resins, and in some versions thermoplastics. 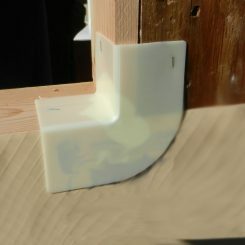 The resulting technology produces a primer-like instant bond to most known materials used in traditional building envelope and roofing applications (excluding silicone). MicroSealants feature a molecular structure that is extremely stable—it is resistant to oxygen, ozone, heat, extreme cold and the effects of temperature recycling. MicroSealants will bond to almost any selected substrate at a molecular level, increasing surface area, and resulting in a “fusing” action, and they are self-healing. MicroSealants can be installed across a wide temperature range, from -20°F to (-29°C) to at least 150°F (66°C). 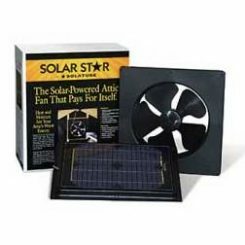 Installed temperature tolerance ranges from -70°F (-56°C) to over 250°F (121°C) on vertical surfaces and in excess of 300°F (148°C) on flat, horizontal surfaces. MicroSealants are extremely tolerant of chemical contact, making them ideal for use in extreme industrial environments. MicroSealants are environmentally stable and contain no solvents or VOCS, are safe to use (virtually, although not technical food service grade) and do not off-gas, so they will not compromise air quality within the building envelope.